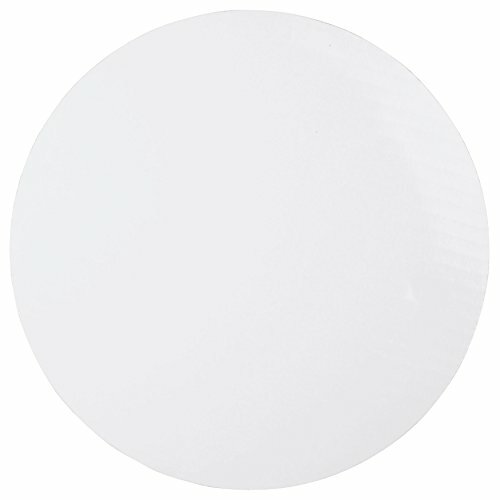 These sturdy round cake boards let you go right from decorating your cake to displaying it! The 12 circular boards fit round cakes. They're also covered with a greaseproof finish and are pretty enough to serve on. 2 oz souffle cups with lids pack of 200 cups and 200 lids. 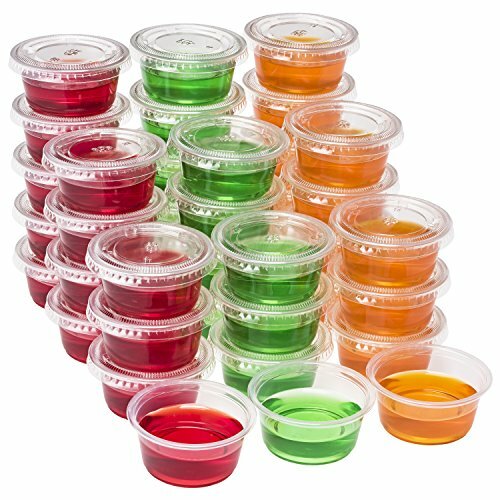 Multi-purpose containers: souffle cups, portion cups, sampling cups, jello shot cups, condiment containers, pill containers. Cups are crack resistant. 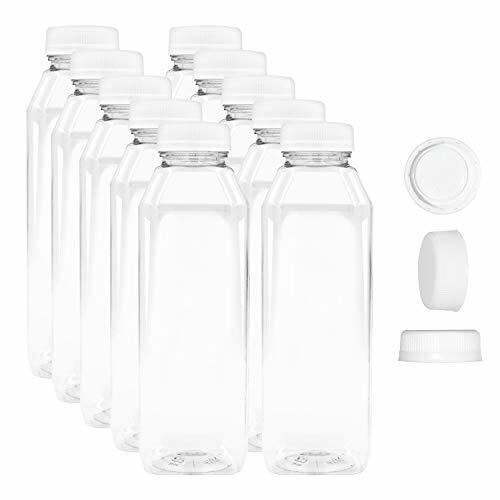 Lids are air tight and leak proof, holds both solid and liquid content. Made of food grade materials. Cup material: Polypropylene (PP, recycle #5), Lid material: Polyethylene terephthalate (PET, recycle #1). Dimensions: top diameter 2.4", bottom diameter 1.75", height 1.2", volume 2 oz. 2 oz souffle cups with lids, value pack of 200 cups and 200 lids. 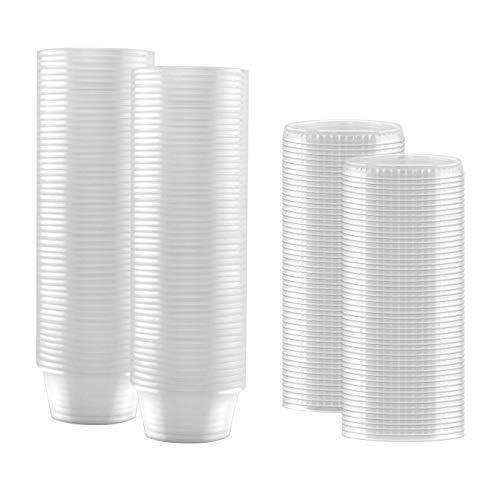 Multi-purpose containers: souffle cups, portion cups, sampling cups, jello shot cups, condiment containers, pill containers. etc. Cups are crack resistant. Lids are air tight and leak proof, ideal for both solid and liquid content. Dimensions: top diameter 2.4, bottom diameter 1.75, height 1.2, volume 2 oz. DuraHome is known for its premium quality products at affordable prices. These great little containers are no different! Meet the versatile 2oz. souffl portion cups, ideal for food storage, meal prep, healthy portion control, and party use. Say goodbye to soggy salads and sandwiches! We designed them specifically for condiments, salad dressing, sauces, dips, salsa, jello shots, pudding, snacks, and a variety of foods and liquids. The cups and lids are completely translucent, so you can easily see what's inside. Made with high-quality flexible materials, that are BPA-free and food safe. The leakproof compact cups fit perfectly in a lunch box, gym bag and picnic basket, so you can take your favorite meals and snacks anywhere you go without worrying about leaks and spills. Lid indentations allow for easy stacking in the cupboard, fridge or freezer. Get creative and use them as disposable toiletry travel containers or to hold pills, glue, acrylic paint, small batteries, stamps, art supplies, beads, thread, paper clips and any nick nacks you have lying around the house. You are constantly going to find new way to use them! Cups measure 1.25" high and 2.4" wide across the top. 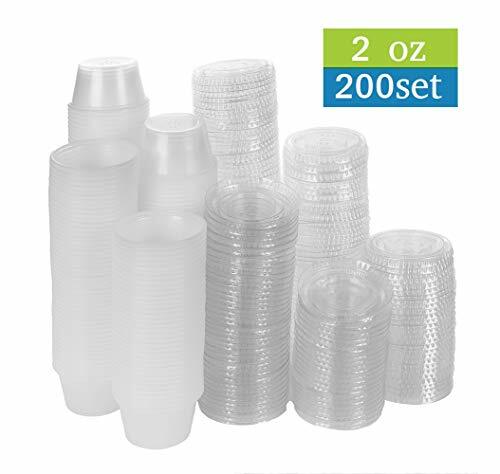 Pack of 150 durable portion cups with lids 2 ounce (59ml) capacity. Used by many food and health enthusiast for portion control or meal prep, and by hobbiest DIY crafters for beads, sequins, pins and slime! Multi-purpose. Great little deli containers for lunch boxes, gym bags, parties and travel. You are constantly going to find new ways to use them! BPA free: Best quality of Food-Safe Grade, Plastic Disposable cups with matching lids made of Reusable, Durable and Crack-Resistant material, restaurant quality level. Great Value: ASF brand quality warrant perfect useable for Souffle Portion cups, jello Shots cups, ketchup sauce cups, salad dressing containers, mustard, tahini, spices, condiments, toddlers snacks, etc. Lid seals tightly: keep liquid from leaking and keep ingredients fresh. Great use for in-house or takeout service in your kitchen, parties, restaurants, buffets, and catered events. 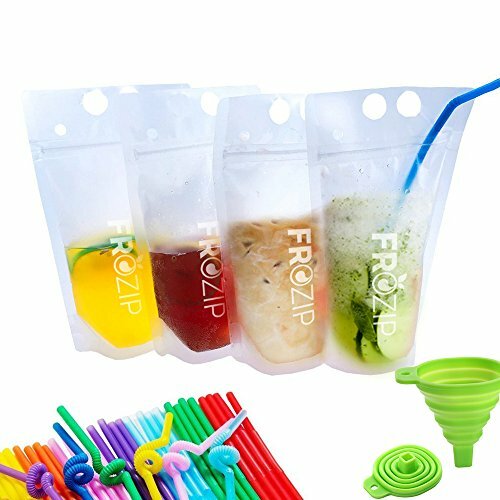 Host Incredible Parties & Help Your Family Enjoy Their Healthy Drinks Thanks To These Fantastic Drink Cooler Bags Brought To You By FroZip! Take your protein shake or coffee with you at the office or the gym, put a green smoothie or juice inside your child's bento box for school, or offer your pool party guests' a margarita or a mojito; these incredible drinking containers are up to any challenge! Made with high-end quality, non-toxic, BPA and Phthalate free materials, our plastic drinking pouches are ideal for holding hot and cold beverages, water, coffee, tea, lemonade, juice, punch, iced tea, energy drinks, smoothies, protein and veggie shakes, and much more. They can also be used as a fun snack holder for birthday parties, festivals, camping, beach gatherings, or even wedding receptions and baby showers! They are crystal clear, which means you can see your drink at any time, and they come to you complete with colorful straws - ideal for kids' parties! If you are still not certain that these unique drinking bottle bags are the best way to go, we have made a list of their best features, in order to make this choice a bit easier for you. Stand-Up Gusset Bottom Reclosable Zip Set of Straw Holes Set of Hanging/Carry Holes Translucent & Crystal Clear Non-Toxic, BPA & Phthalate Free With 50 Colored Straws Bonus Funnel Included Oh, and did we mention that our drink holder bag set also comes with a FULL money-back guarantee? That's right; in case our pouches don't meet your highest expectations, we will give you your money back, and will not ask any questions about it. Get Your Own Set Of Drinking Bags Today & Start Planning Your Next Event! A MUST-HAVE ESSENTIAL FOR EVERYONE - Coffee, tea, energy drinks, healthy smoothies, protein shakes, and cocktails; anything you can imagine and more can be easily stored in our plastic drink containers. They can hold both cold and hot drinks, and they are made of non-toxic, BPA and Phthalate free materials, which means they are perfectly safe for your, your guests' and your children's health! EASY TO FILL, EASY TO USE - Simply choose the beverage of your liking and use the funnel to fill these high-quality drinking bags. The reclosable zip ensures that there are no leaking accidents, while the stand-up gusset bottom allows you to place your drink on a table or a stand. What's more, our pouches also feature two sets of holes; one for holding their straw and one for allowing you to hang them, if the aforementioned table is full! IDEAL FOR PROFESSIONAL & HOME USE - Whether you're a caterer or party planner and need something different than the plain old boring and, in cases, dangerous usual glassware, or you are simply throwing a kids' or Grill 'n' BBQ party in your backyard or garden, these handy, translucent drink containers are the best choice you can make. STRAWS & HANDY FUNNEL INCLUDED - Our set comes fully complete with 50 fun and colorful straws, so that you, your guests, and your children can happily enjoy your drinks. Additionally, we have also included a practical funnel, to ensure that you can effortlessly fill your bags with the beverage of your choice, without spilling a single drop! ORDER WITH 100% CONFIDENCE - At FroZip, we don't compromise when it comes to your satisfaction. In the unlikely event that you aren't perfectly content with your disposable drinking bags, you shouldn't worry; we have got it backed by a hassle-free, no questions asked, 30-day money back guarantee. These Clear plastic souffl /portion cup with a clear plastic lid is a great choice for serving anything from condiments to whipped butter. Our portion cups come with lids that firmly lock and wont spill. The cups are made from food-grade BPA-free plastic Polypropylene, so they're perfect for everything from medication portions or kiddie bites. They are also perfect for jello shots, condiment cups, tasting/sampling cups. The 100-set pack is perfect for home use, institutional, schools, food-service and restaurant use. It can safely transport side sauces such as ranch dressing, marinara, salsa, and more, and its translucent design allows for easily seeing the cup's contents. 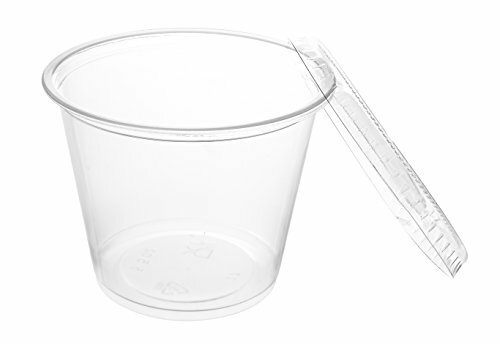 FLEXIBLE USE: These cups with lids are ideal for salad dressing, food tastings, Jello shots, condiments, souffl portions, toddler snacks, etc. 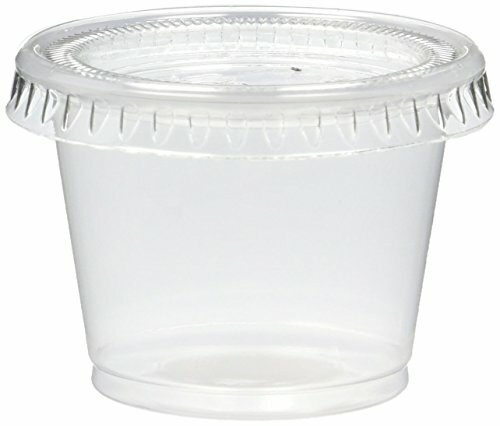 Portion cups with lids ideal for salad dressing, sauce cup, gelatin, condiments, toddlers snacks, etc. Best quality, reusable, durable and disposable, restaurant quality. Reditainer, is known worldwide for delivering greats products at low affordable prices. Our souffle cups are no different. The souffle cups come with lids that firmly lock. The cups are made from a unique plastic called Polypropylene, this type of plastic is durable yet flexible and clear translucent color. They are perfect for: jello shots, condiment cups, sample cups, or anything you could use a souffle cup for. 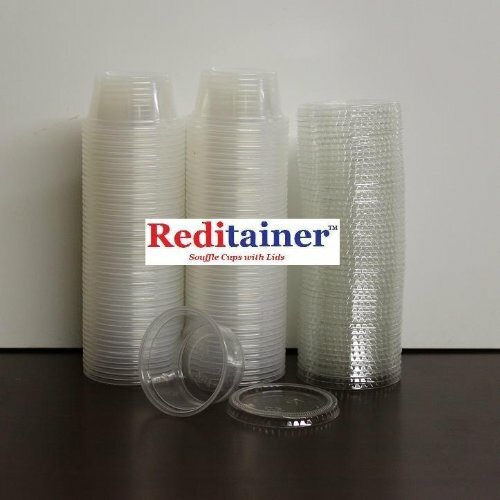 Reditainer - Souffle Cups are the perfect souffle cup, give them a try today! Mr Miracle is known worldwide for delivering greats products at low affordable prices. Our souffle cups are no different. The souffle cups come with lids that firmly lock. 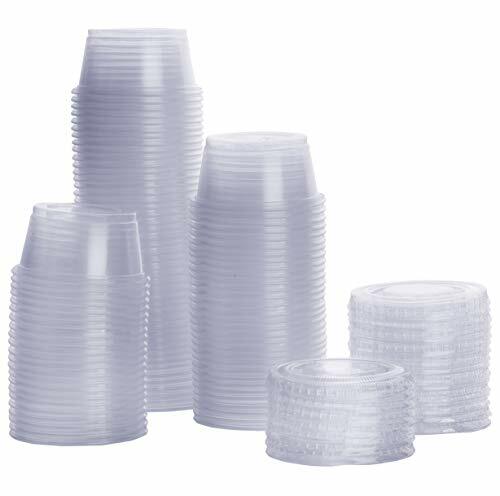 The cups are made from a unique plastic called Ploypropylene, this type of plastic is durable yet flexible and clear translucent color. They are perfect for: jello shots, condiment cups, sample cups, or anything you could use a souffle cup for. No more stress about the little things - The perfect small container for any use! Condiments!The small plastic cup containers with lid make it easy to provide small amounts or portion control of various condiments. The cup containers make it easy to store ketchup and salad dressing for family reunions, parties and catering events. These also help your family restaurant control cost for those to go orders. Little beads and jewelry supplies can be organized and separated with these small lid containers. The small size will help keep supplies nicely organized, and easy to find. Your husband's garage mess that is filled with small nails and screws can now be easily organized with these small storage containers. Throwing the largest college party has never been easier with these shot glass sized containers. Perfect for Jello shots and a quick shot glass that can be tossed after your guest is done drinking. These 2oz cups with lids meet all FDA requirements for food storage. - Empty gelatin packet into a large mixing bowl and add boiling water. - Whisk together 2 minutes, or until gelatin is fully dissolved. Add vodka and cold water. - Pour mixture into plastic containers, shot glasses, or small paper cups aligned on a cookie sheet. - Refrigerate until set (at least 3 hours or overnight). One pack of 100 cups can easily keep the party going all night. STOCK UP AND SAVE WITH A GREAT VALUE SET OF 100 - These condiment cups come in a set of hundred 2 ounce portion cups and 100 matching fitted lids. 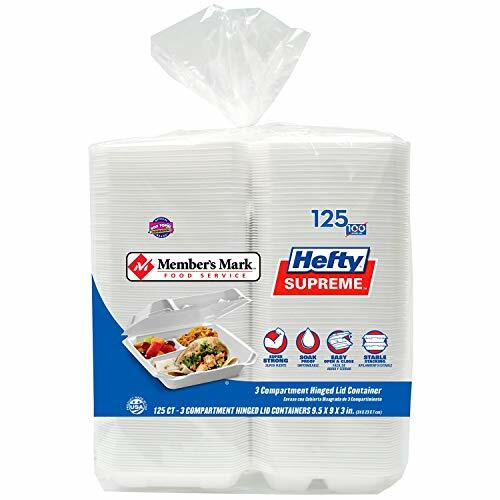 Use this bulk pack of mini containers for large events, or parties where portion control is needed. This are also great to stock up your house, kitchen, school's teacher room, etc. 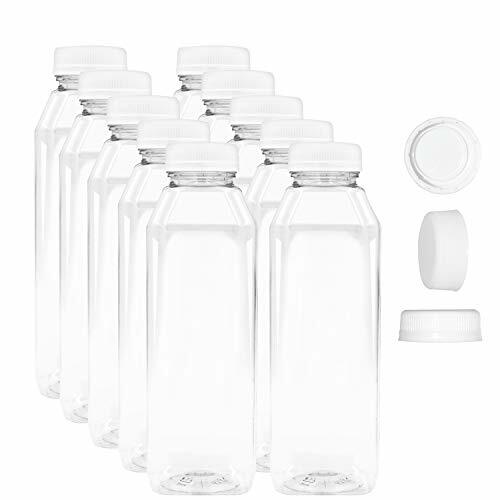 MATCHING FITTED SNAP ON LID - These small container cups come with cap that provides a strong seal and can easily be snapped on top of the cup. The cover can easily be removed and reattached to save for later. These small plastic cups with lids also offer a stable surface for stacking and creating a catering display. USE IT ON MANY APPLICATIONS FOR MANY OCCASIONS - The cups are not just for ketchup and sauces. The lid and small size are perfect for soy sauce, condiments, salsa or tahini! You can also use as a small cup for adult beverages and fun drinks, like Jello shots! These cups are even able to help organize small nails and screws in the garage. COMPACT DESIGN, PERFECT FOR THE NECESSARY PORTION CONTROL AND TRAVEL USE - The compact container can fit inside to go boxes or lunch bags. Great for storing crafting supplies that need just a little container. They will also fit nicely in any drawer or side compartment. The 2 ounce size is just right for small seasonings/spices for cooking. FDA APPROVED, FOOD SAFE PLASTIC - eat and store your foods and sauces with confidence, knowing that those mini storage containers for sauces, dips and liquid is made with 100% food safety plastic materials, making it the perfect choice for every household, school, party, restaurant, deli and other food serving places. Duro brand paper handle bags are a great way to provide strength and carrying convenience in a paper substrate. Whether you're carrying a sack full of cantaloupes or a few family-sized bags of potato chips and tortilla strips, these Handle Bags are proven to withstand a sizable load. 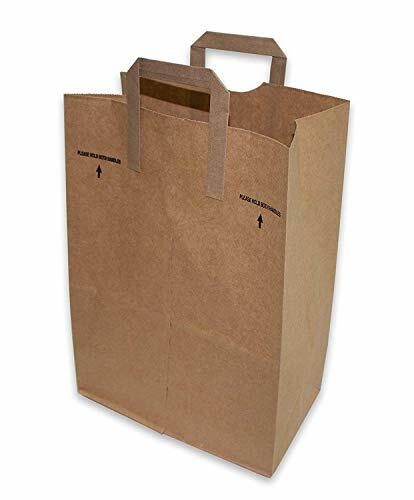 Grocers rely on these shopping bags for their strength and self-standing style that allows for easier loading and efficiency at the checkout. These 2oz. clear plastic souffl /portion cup with a clear plastic lid is a great choice for serving anything from condiments to whipped butter. Our portion cups come with lids that firmly lock and wont spill. The cups are made from food-grade BPA-free plastic Polypropylene, so they're perfect for everything from medication portions or kiddie bites. They are also perfect for jello shots, condiment cups, tasting/sampling cups.